Amplify your brand, drive revenue and spend smarter. 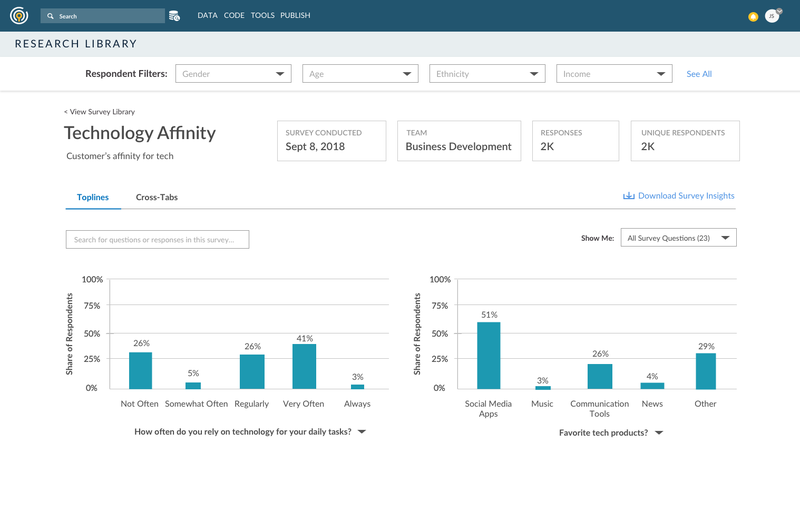 Drive faster, smarter decisions for your brand with access to the right tools and curated, customer-level data to meet your business goals. Whether you're testing product concepts, selecting customer segments, planning creative, or measuring the effectiveness of your campaigns, our technology provides you the data and information you need to help drive the best decisions about how to engage existing customers and reach new ones. Our Research Library provides a single place to track changes in the metrics that are most important, like brand health related to marketplace perception. With a dynamic interface and accurate long-term trend lines, our software helps you understand how and why those changes happen over time and the impact those changes have on customer behavior. 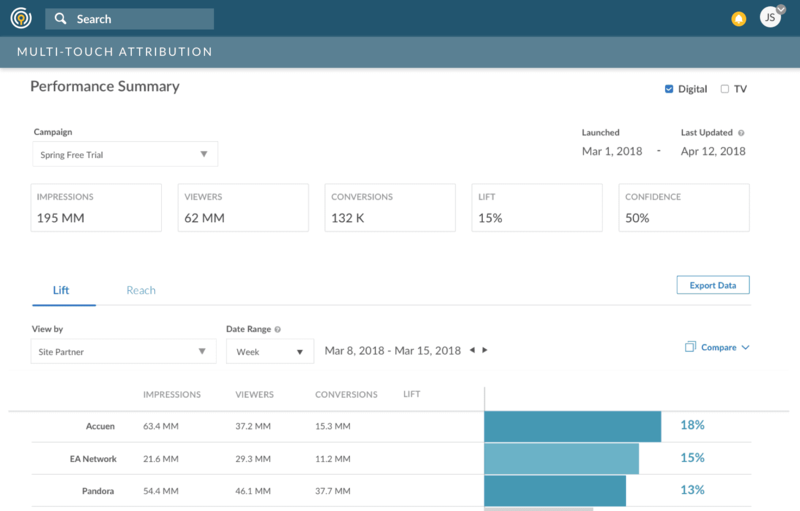 Civis Attribution gives you the deep performance insights you need with an approach that measures the incremental impact of your marketing campaigns, allowing you to identify areas of strength - or diminishing returns - at the person, ad, site, or channel level. By combining cross-channel measurement and leading data science methodology, our software gives you crucial knowledge so can optimize your marketing for growth and cost savings. Civis Media Optimizer connects your target audience with our rich viewing database. Proprietary algorithms choose the combination of shows that provide the most efficient audience exposure to meet your goals. 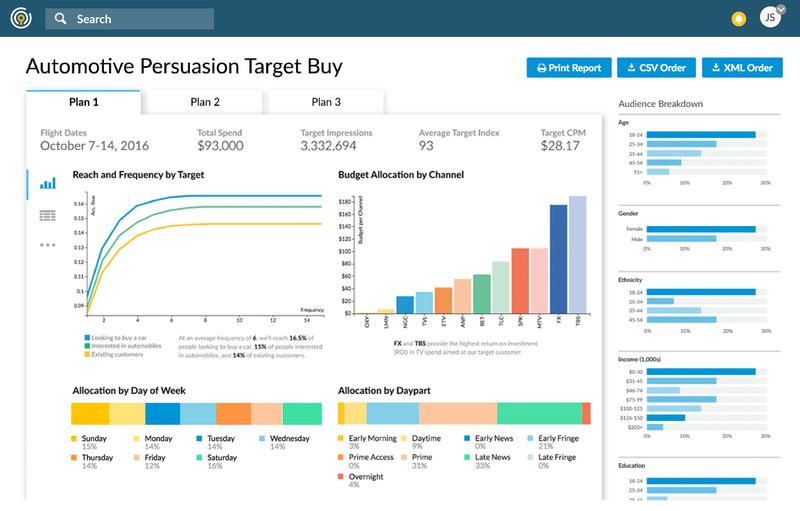 With Civis Media Optimizer, you get detailed recommendation reports including reach, frequency, content type, daypart, and broadcast vs. cable. When you're ready, easily download the recommended media schedule for negotiations and implementation. Identify the campaigns, partners, or creatives that are contributing the most to your marketing program with transparent solutions that go beyond simple attribution models and improve the efficiency of your marketing campaigns. Make crucial decisions for your business based on millions of data points. Combine your data with our robust consumer data and in-house research capabilities to segment your market, unlock growth, and bridge the gap between strategy and actionable insight. Whether you want to find more high-value customers, identify high-risk customers, or better understand who would be the best fit for an upcoming campaign, use our predictive analytics technology to identify and target the right customers. Learn about our data-driven journey with McDonald's, resulting in a 3–5x increase in same-store sales.